Euclidean distance is a simple way to measure the distance between two points. It can also be used to measure how similar two sports teams are, given a set of variables. 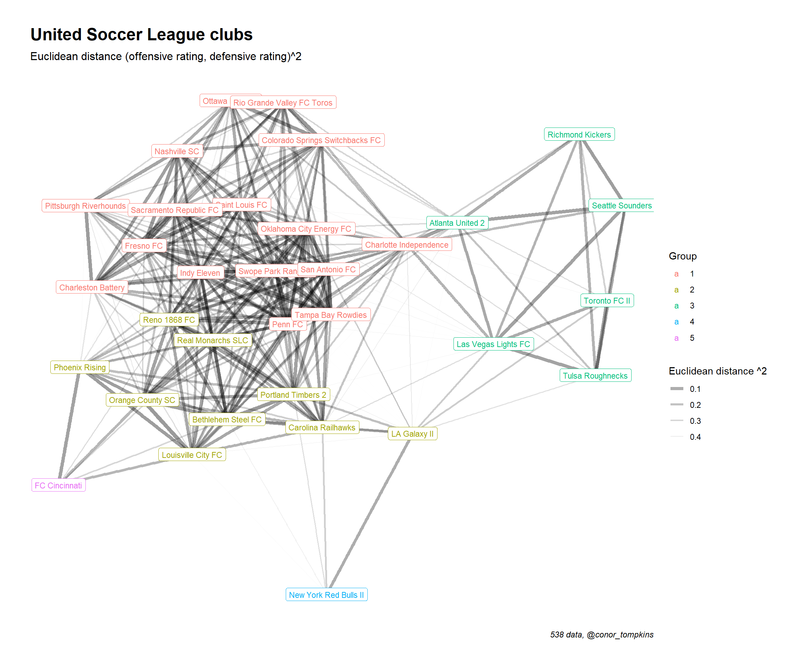 In this post, I use Euclidean distance to calculate the similarity between USL clubs and map that data to a network graph. I will use the 538 Soccer Power Index data to calculate the distance. This code downloads the data from 538’s GitHub repo and does some light munging. This is the code that measures the distance between the clubs. It uses the 538 offensive and defensive ratings. In this snippet I set a threshhold for how similar clubs need to be to warrant a connection. Then I graph it using tidygraph and ggraph. Teams that are closer together on the graph are more similar. Darker and thicker lines indicate higher similarity.